When Emily Rawlings moved her family to Kingston on the Kitsap Peninsula in 2017, she knew she was up for a pretty significant commute to her Capitol Hill barbershop, The Scotch Pine. It’s worth it, she says, for a more peaceful environment and plenty of outdoor space to raise her three young kids. As they settled into a quieter life on the peninsula, she realized the area had nothing like her hip, retro barbershop business. So, in October, Rawlings opened a second location closer to her new home in a remodeled 1963 Boles Aero trailer. 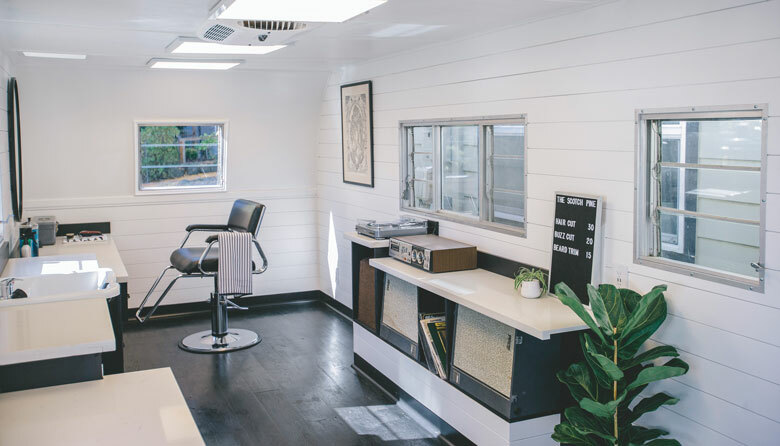 Inside, there are two chairs for stylists, available for walk-in trims as well as by appointment; outside, a stunning mural by Seattle artist Kyler Martz matches the trailer’s vintage pinup aesthetic. For now, clients can find the trailer parked semipermanently in the lot at what Rawlings calls the “family dive bar,” the Filling Station (Kingston, 11200 NE State Route 104; 206.388.9331), but by next year, she hopes to tow it around to offer on-the-spot cuts and trims at events such as Bumbershoot or for weddings.